Former Vice President Joe Biden’s rejection in 1975 of forced busing — he argued that it might interfere with “the entire black awareness concept” — probably will not haunt him more than any of his dozens of other cringe-inducing episodes in 47 years in public life. In fact, some of the thoughts he offered then might actually serve him well among a Democratic electorate more obsessed with identity politics than ever before. Still, the ideas he expressed that might actually help him are the very ones that should be most strongly rejected today. At issue is a 1975 National Public Radio interview unearthed by the Washington Examiner’s Alana Goodman, in which Biden seems to question not just forced busing but also the wisdom of racial integration in general. The Internet already is full of people saying this purportedly segregationist stance might kill Biden’s chances for the presidency in 2020. Alas, I think otherwise. 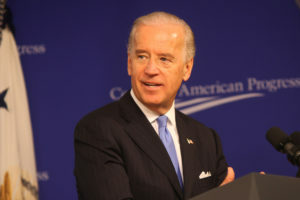 First, nothing permanently sinks Biden: not plagiarism, not a life-threatening brain aneurysm, not his remarks on Barack Obama being “clean,” not his creepy hands-on policy with female visitors, and not any number of verbal gaffes of the sort that prove deadly to plenty of other politicians. More importantly, the “black awareness concept” that he offered in defense of self-segregation is actually well in line with the zeitgeist of 21st century progressivism. All over the country, for example, colleges are now helping black students self-segregate in black-only dormitories and social organizations, black-only graduations, and (infamously) a blacks-only-allowed-on-campus day at radical Evergreen State College in Washington State. Indeed, the language Biden used was quite obviously that of someone trying, however inelegantly, to express solidarity with black people, not to hold them down. He said that forcing blacks to integrate, against their will, “is a rejection of the whole movement of black pride, is a rejection of the entire black awareness concept where black is beautiful, black culture should be studied, and the cultural awareness of the importance of their own identity, their own individuality.”….